Chippewa Falls, WI—Spectrum Industries Inc. has promoted Denise Parkhurst to Integration & Reseller Channel Customer Support Manager. Denise Parkhurst will assume responsibility for the strategic support of Spectrum’s reseller channel partners and the supervision of the channels sales support team. Based out of Spectrum Industries headquarters in Chippewa Falls, Wisconsin, Parkhurst and her team will focus their efforts on delivering exceptional customer experiences by supporting the customer before, during and after each sale. 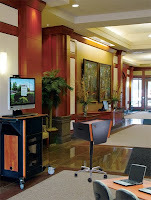 Spectrum Industries is widely viewed as an industry leader and innovator in the manufacturing of furnishings to support audio-visual, presentation and technology-rich environments. With the increase in demand and popularity of Spectrum’s products it also brings an additional level of support for the channel partners who sell the products, incorporate the audio-visual and technology equipment and install them in colleges, universities, schools, government agencies and corporations across the United States. Prior to the promotion, Parkhurst served as Spectrum Industries Customer Order Manager and was responsible for developing and supporting Spectrum’s on-time delivery initiatives. She also brings years of supervisory, contracting, and support experience to the position.